Contra Costa Faculty and global health fellows visit core faculty from the department of Family Medicine in Malawi, May 16th, 2017. 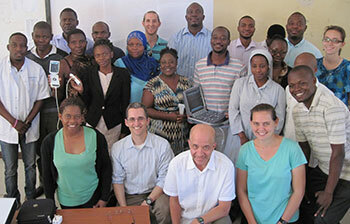 Dr. Neil Jayasekera teaching point-of-care ultrasound to Malawian clinicians. 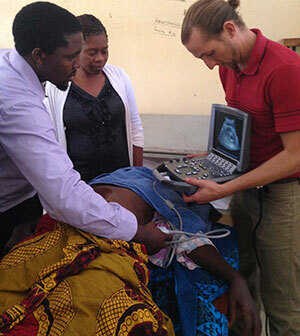 Dr. Jason Reinking, former global health fellow, teaching point-of-care ultrasound to Malawian resident physicians and clinicians. To equip family physicians with the knowledge and experience to be leaders in global health. Support the development of family medicine in under-resourced countries through collaboration, mentorship, and clinical education. Global Health Fieldwork Learn, serve, and teach abroad during 6 months of fieldwork at a vetted international site with a focus on teaching local medical students and training local family medicine resident physicians and contributing to the development of Family Medicine in these countries. Gain invaluable experience working with Partners in Health and Nkhoma Hospital in Malawi, Partners in Health in Chiapas Mexico, and Jan Swasthya Sahyog (JSS) Hospital in India, and UCSF-supported Aga Khan Family Medicine Residency in Nairobi, Kenya. Global Health Philosophy We believe the most ethical way to work is by teaching and mentoring the next generation of local family physicians and helping them serve their communities. Advanced Clinical Training Learn and practice with excellent clinical educators during 6 months of hospitalist medicine, emergency medicine, outpatient clinic, or obstetrics (with experience) at a nationally recognized family medicine hospital. Structure The fellowship is for 1 or 2 years. We make every effort to customize your fellowship experience to help you achieve your goals. Selected candidates can participate in the fellowship by working domestically at their own clinical site, or with UCSF-affiliated partner programs such as Santa Rosa, Natividad, or UCSF Fresno (OB/FM position). Point of Care Ultrasound (POCUS) Training Learn bedside ultrasound through a comprehensive training program with didactics and bedside training taught by leaders in POCUS education. Tropical Medicine Training Through the West Virginia University Global Health Program. Graduates of the course are eligible to sit for the ASTMH CTropMed® exam. Faculty Development Through the UCSF Faculty Development Program with an emphasis of teaching leadership, teaching and communication skills. Global Health Track Program Development Facilitate and lead the Global Health Track at CCRMC that accepts 6 Family Medicine residents per year. Scholarly Work Through the UCSF Global Health Sciences, Clinical Scholars Program. Educational Activities Access to online, Global Health Education Consortium (GHEC) module based program through UCSF Global Health Sciences and/or Global Health Boot Camp through UCSF HEAL Initiative. Mentorship By program directors or choose a mentor from 10 other Contra Costa faculty with extensive Global Health experience. Salary/Benefits As a per diem employee, the fellow essentially receives attending wages during their time at Contra Costa. Stipends are available for international flights, health care/evacuation insurance and course fees at UCSF. Full malpractice and liability insurance at Contra Costa Regional Medical Center offered. Qualifications Board eligible Family Medicine physician or graduating senior Family Medicine resident. Previous global health experience, excellent communication skills, humility and flexibility are desired characteristics. Ultrasound training by former fellow, Dr. Jason Reinking. Since 2015, our fellows have been working in Malawi with Partners in Health, Nkhoma District Hospital, and the Malawian College of Medicine Department of Family Medicine to develop the nascent field of family medicine in Malawi. The primary focus of fellows is to provide direct mentorship and teaching for the Malawian medical students during their family medicine clerkship both in the hospital and clinic setting. Our fellows are an essential part of their educational and clinical experience. Each fellow also works on systems-based issues and quality improvement projects based upon the identified needs of the community in collaboration with Partners in Health and Nkhoma. Since 2012 we have worked with Partners in Health in the underserved area of Chiapas, Mexico. Our fellows provide mentorship, supervision, and training for newly graduated Mexican physicians who are doing their year of social service in Chiapas in this network of rural primary care clinics run by Partners in Health. Since 2015 we have had a relationship with Aga Khan Family Medicine Residency in Nairobi, Kenya supporting their newly-formed program. In 2017 we formed a collaboration with Jan Swasthya Sahyog (JSS) Hospital in rural India which has a new family medicine residency. Our fellows work along side the family medicine residents and assist in clinical care in this busy, mission-based, public-health-minded, tertiary care facility in the rural tribal area of central India. All of our international sites exemplify the ethical principles of global health such as building capacity, sustainability, and reciprocity, with a focus on supporting family medicine education. The Contra Costa Family Medicine Residency program has a strong reputation for attracting physicians dedicated to working with the underserved both nationally and overseas. In 2011, residents of the global health track requested further training beyond residency to strengthen global health skills with focused support and mentorship. Through this initiative, our Global Health Fellowship was born, spearheaded by Dr. Neil Jayasekera. Malawian family medicine residents and clinicians after completion of the first point of care ultrasound course in Mangochi, Malawi. Our first project from 2011-2013 was a collaboration with Massachusetts General Hospital's, Division of Global Health and Human Rights to help rebuild medical education in South Sudan through teaching medical students after the end of the civil war. In our second project from 2013-2015, we partnered with Maseno University Medical School in Western Kenya to successfully develop a new Family Medicine/Emergency Medicine Residency. Since 2015 the global health fellowship has been associated with UCSF Department of Family and Community Medicine. We accept applications on a rolling basis from September 14th to October 19th. All applicants get a telephone interview and selected applicants will have an in-person interview at Contra Costa. Final notification of accepted applicants will be January 18th.